My name is Penny and I am a new member. I found this blog after the last sewalong started, and thought all of your bags were fantastic. 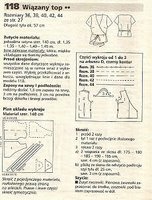 I have been sewing for years, since I was in about 8th grade. Then I got into quilting, and have knitted all along. Most recently, knitting has taken over my crafting life, and is threatening to take over the rest of it too! I have two small children, a 3-year old boy, and a girl who will be 10 months on Saturday. So, since I am trying to lose some baby fat, and I don't want to try to fit a top to me, I will be sewing for my daughter! 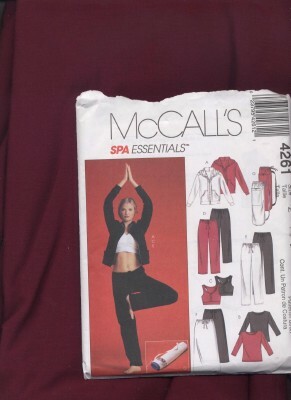 McCalls 3603 is my pattern selection. I have not found THE fabric yet... 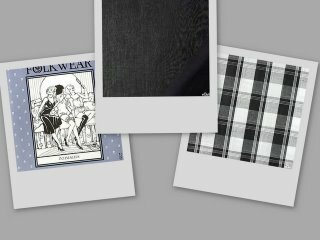 I am bad about getting a picture in my mind of the fabric I am looking for, and then cannot find it in any store. If I don't find something perfect in the next day or so, I'll settle for close to perfect :) I'll probably make the capris too, they are too cute! Hard to tell because I have ordered, but not yet received the pattern. This one is from Decades of Style. It's a reproduction of something from around 1917. I bought some white wool crepe and sent it through the washer and dryer. Now it's soft and textured and wonderful. I don't yet know what I will use for edges, but I like the look of the binding. Of course, this falls in among the new kitchen curtains, the new patio tablecloth, etc, etc, etc. I found this Sew Along at the last minute and was thrilled to hear I was able to join in. Sewing has been my main craft for many years but I lost enthusiasm some time ago. Knitting has recently become a new addiction for me and when I read the guidelines for this I felt it was just what I needed to get my machine humming again. 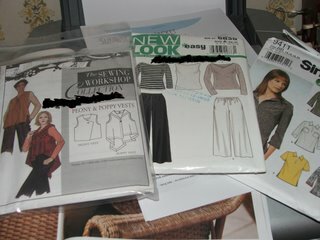 Pattern and fabric purchased in time for the start can't wait! After seeing the post featuring this pattern, I just had to make this shirt. I love a square neckline and it seemed so easy, and it was! 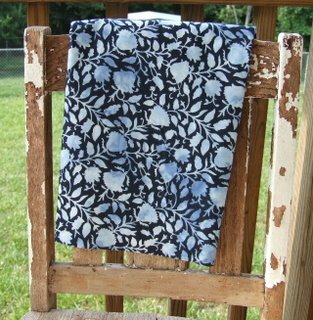 I made it from a vintage seersucker sheet that I scored for a quarter at a garage sale. It's extremely comfortable and I will be making a lot more. I could wear one everyday! 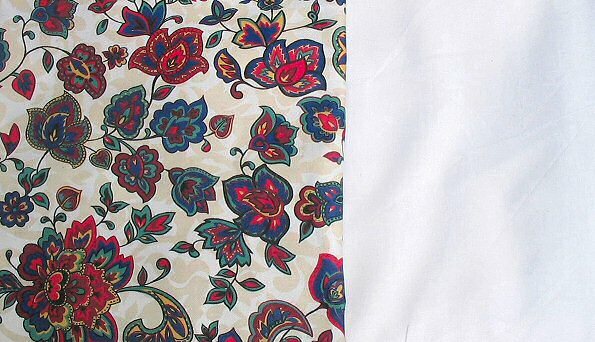 And here are the fabric choices: the flowery cotton for the front panel, the white cotton/linnen blend for the rest. Hello all, my name is Lindsay and I am so excited to be taking part in this sew along. I am a relatively new to sewing and knitting, but like most totally obsessed! I have chosen New Look 6464, which is a nice halter type top. 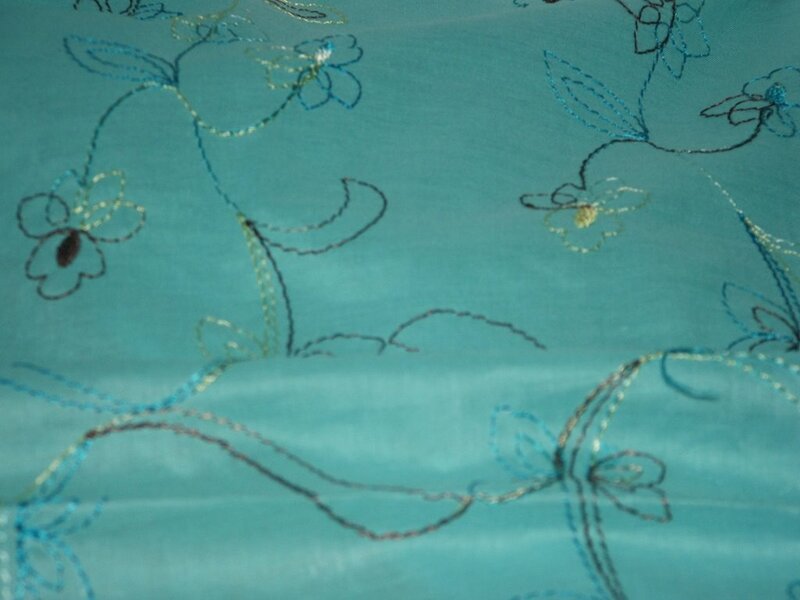 My fabric is a turquoise and blue paisley. I think it will be nice, and hopefully it will fit me, or at least someone I know! Can't wait to get sewing and see all the pretty tops! Hi everyone. I'm very excited to get started. My grandmother taught me to knit when I was 10, but it wasn't until the last 8 years that I really got into it. I did sew a couple of dresses when I was a teenager, but I should've asked for more help. My sewing machine has been seeing a lot of quilts lately, soI think it's time to introduce a new project so it doesn't get bored. Having the deadline should help me to get this done as well. I'm doing Buttericks B4395. The upper middle version. Vermont actually gets quite warm and humid so I need some cool shirts to wear this summer. Can't wait to see everyone elses! Hello! My name is Martina and I am a knitter! I used to refer to myself as a sewer but for the past 12 years or so I have put aside the sewing side of my creativity and become a truely obsessive knitter. The love the feel of making fabric so I knit. I also just plain love strolling around fabric shops stroking the goods. Sew (insert snorting laugh), I decided to take up this sew a long challenge and make a top. 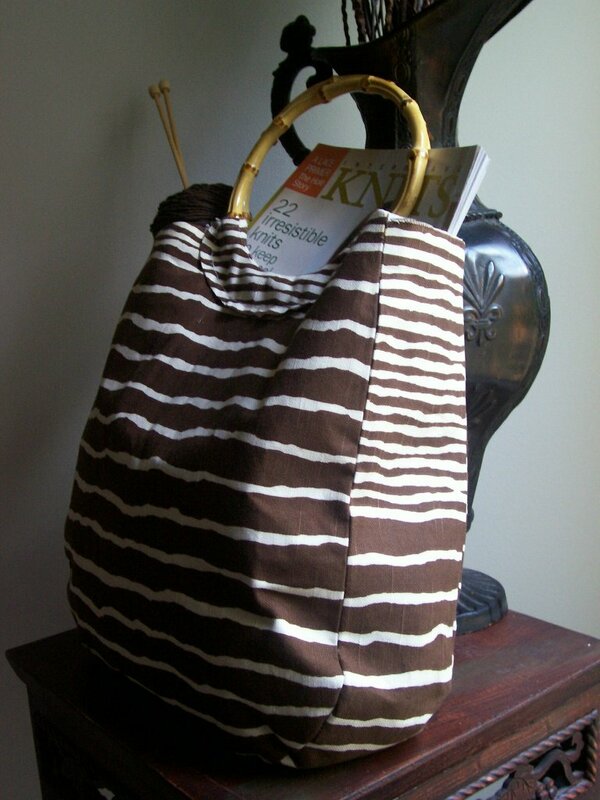 Even before I was officially accepted as one of the group I had headed out to buy the pattern and the fabric. 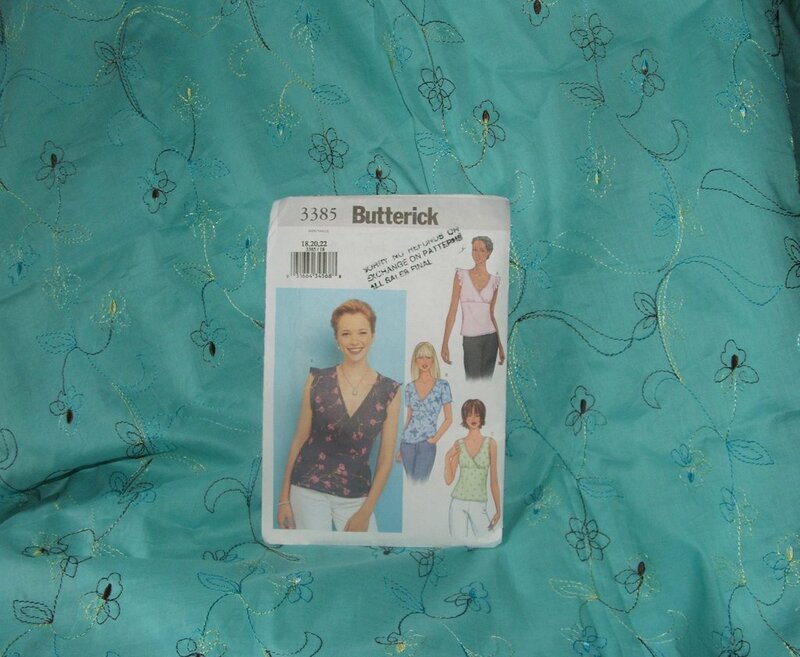 The pattern is a Butterick one. Number 3385. I will be doing the version with the sleeve flounce. 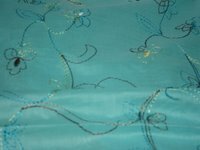 The fabric is an emboidered Clarrisse cotton mix. It should be nice and cool for summer. I will assume that I will have it done on time so I will actually be able to wear it this summer! I look forward to seeing everyones progress. On with the game I say!! Looking forward to sewing again with you gals! When I saw the topic of shirts, I thought : "eeek!". I was NOT looking forward to getting a garmet to fit me and look nice, then I remembered a project in my holding bin: a shirt for my daughter. I saw the idea I'll be using in the Handmades newsletter almost 2 years (?) ago and loved it (their website has a ton of idea outfits). 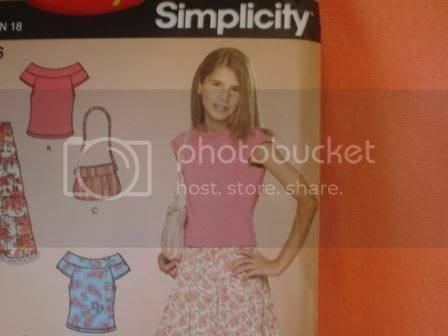 It's a little sleeveless smocked blouse with Hello Kitty's head picture-smocked in the center. 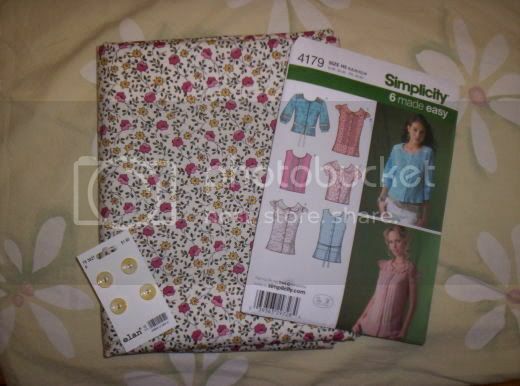 The bright pink fabric will be the top and the Kitty patterned fabric might be a little skirt or capris. The catch is that there is no pattern for the head, but the owner was nice enough to send me an idea of how to make my own. Should be fun to figure out. Now - can I get this done in time? Looking forward to seeing everybody's amazing creations! I've been knitting and sewing for many years, and I learned it all from my mom. In the past few years I've been very addicted to knitting, but I always want to do more sewing. This is such a great way to motivate myself. For some reason I have no problems sewing up a knitted garment, but sewing clothing seems more daunting. 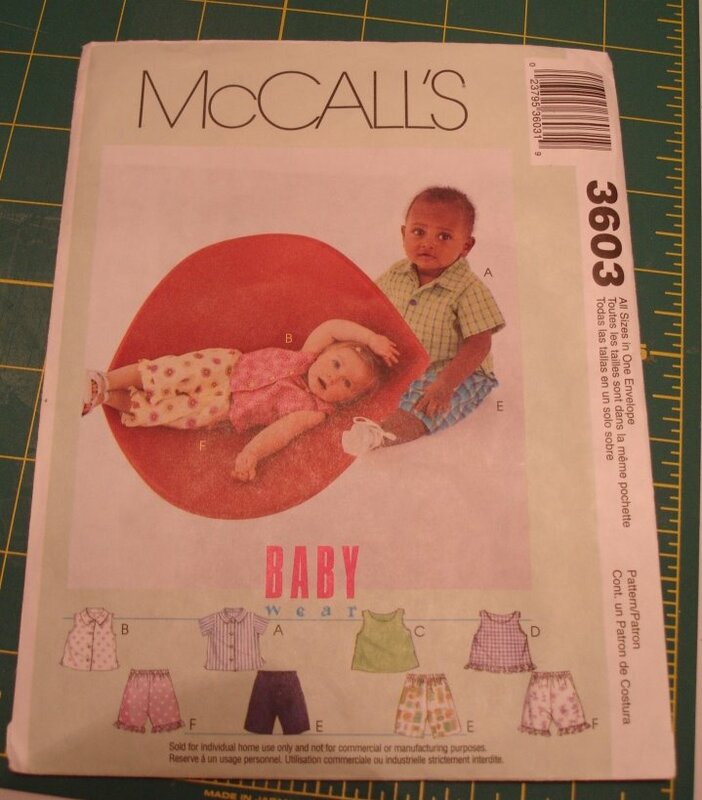 Anyway, I've decided on a pattern, and we'll see if it is really "Easy to Make" as the pattern says! 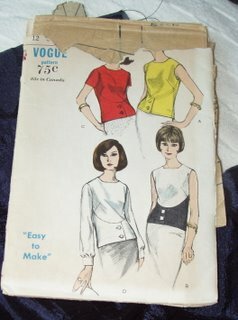 I'm using one of my mom's patterns from the late 60's early 70's -- I really love the retro look of it. I'm using a gauzy see-through material, which is a little different than what the pattern specifies but I think it will be cute. hello all! 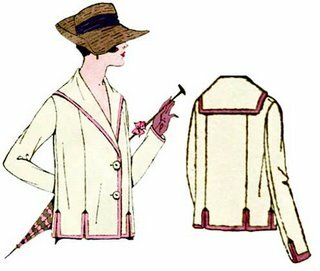 i've decided what i'll be sewing for this - finally. it's going to be a little summer top for my daughter. i chose this pattern because it had a great little skirt and bag too.... also, can't beat $1.76 on price! i've got 2 choices of fabric. if there is enough of the green, i'll make it. but if not, peach it'll be. My name is Sarah- I'm a knitter, sewer, Master Gardener, cook, beader, and probation officer (my day job). This is my first internet sewalong group. I am excited to join. I bought several Simplicity patterns yesterday. I am going to make Simplicity 4353 for the June sewalong. The "to do" list for this months project! This top is the McCalls top from this pattern, which I think has been at this stage here for at least 6 months. I am having facing issues, not quite to sure how to go about the facing at the point of the "crossover" bit...But it wil not beat me, I will have the darn thing done! So I am glad that others have decided to do this one, maybe you can help me when you get to that bit! Also planned for this months task is a knit top from this New Look pattern, as I have never sewn with knit fabric before, at all. I think I deal with my fears by avoidence.... I don't have fabric yet, but I am just going for a plain knit, maybe grey. 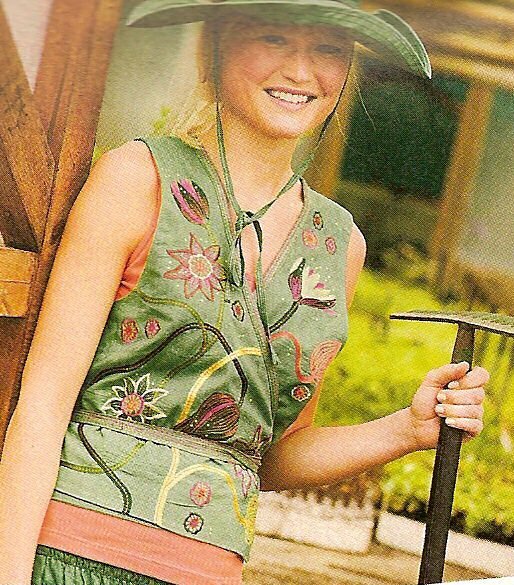 And if I get these two finished, I am going to try this vest, the Poppy vest from The Sewing Workshop Collection. 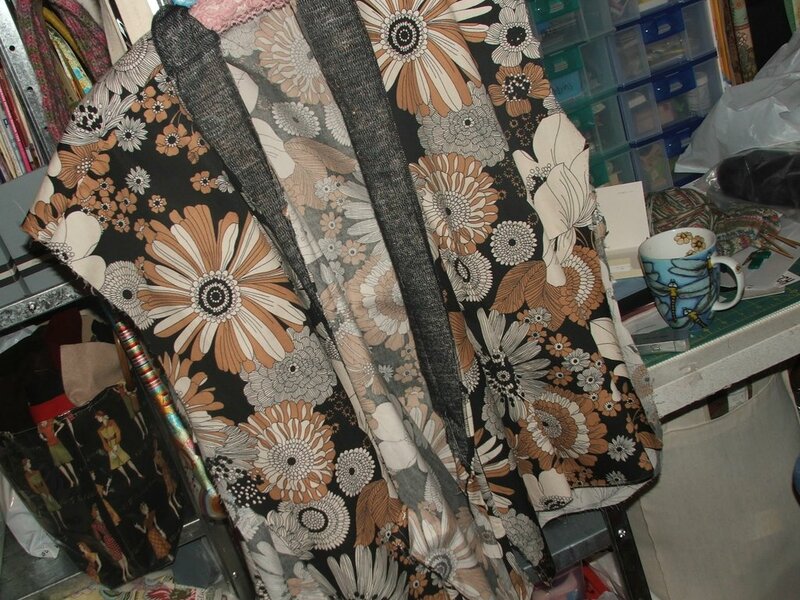 As I am on the Wardrobe Refashion Pledge I am planning to use some fabric from an old skirt of mine, it's a bit small but the fabric is gorgeous. Does a vest class as a top? I hope so, as it is Winter here and a vest would go nicely over the tee from the last pattern up there! The vest, the grey knit top and another pattern if I have time! Well, I'd better go and get sewing! I am excited to join this fabulous group. I have been knitting for a number of years, and this love has inspired me to do other crafty things, and so i resurrected my sewing machine. I have been sewing 'simple' things like pillows, bags, aprons, softies, but now i'm feeling a bit more comfortable with the sewing machine and patterns. So, i think this is a perfect time for me to start working on sewing clothing - aka things that fit my body! 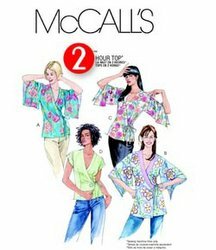 I bought this pattern months ago but felt a bit intimidated to sew a shirt but with this group as support, i think i can do it! I have yet to buy the fabric for it, but i'll do it this week. I'm looking for the perfect black cotton eyelet. Happy stitching everyone! I've been involved in sewing, knitting, crocheting, counted cross-stitch, etc. for a long time. (Just how long we won't go into!) I started out as a HS Home Ec teacher, but made a switch to University teaching, and have been teaching Marketing courses. I'm looking forward to the project and to being part of something that looks like so much fun! 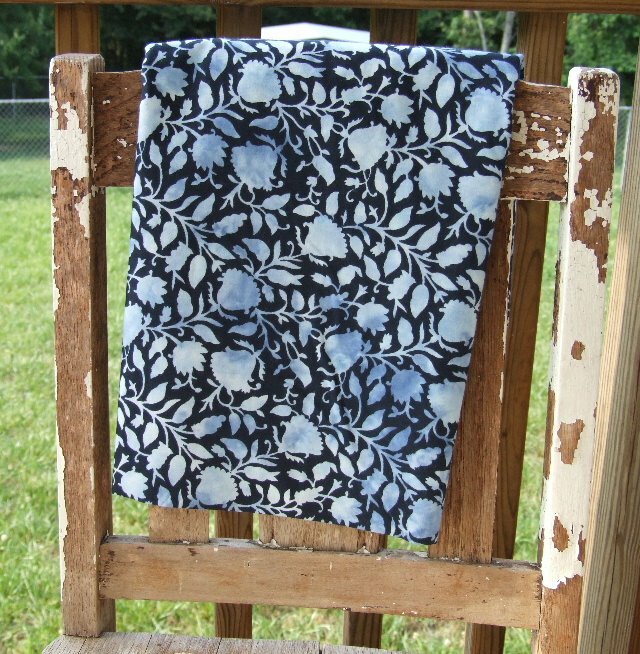 I went to Hancock's yesterday and got the sale price on this pretty blue batik fabric for my top. 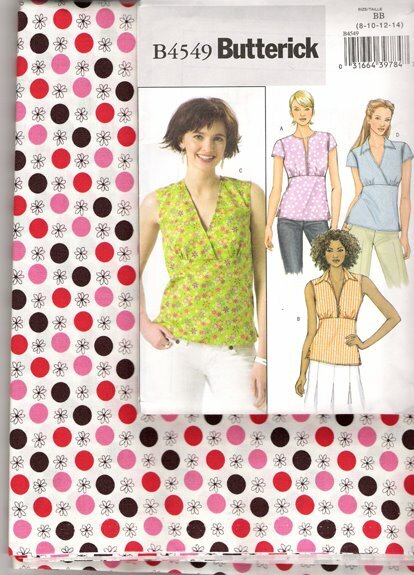 I am also planning on making the Amy Butler halter top. I am not usually one for halters, but this one is nice and loose on the bottom part, and seems to give good coverage up top. It sure would have been nice to have yesterday when we had 93 degree temperatures! Summer always seems to arrive on Memorial Day weekend! Now, off to my favorite quilting shop for the pattern! I just order this pattern and fabric from Equilter. I am so excited to start sewing! So my local fabric store had an amazing sale on last night, and unfortunatly I could not bring home all the fabric I loved. But I did get some great fabric to make the CUTEST shirt!! It is a little button up shirt with frilly short sleeves and I couldn't resist. The fabric remind me of old fashioned womans clothing so I thought it would suit the pattern. 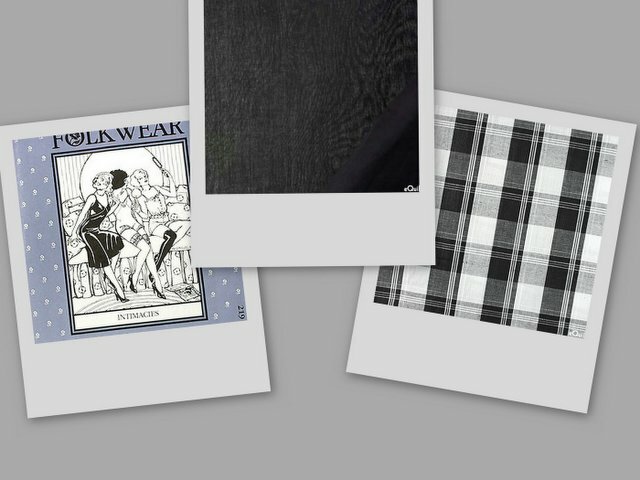 The veiw I am making is on the bottom left, and it's the same as the model on the bottom is wearing but without the lace. I can't wait to see everyones shirts, I can't wait to get mine started!!!! Modifications:Decreased the width of the yoke by 2 inches. Placed invisible zipper on left side instead of back. My name is Eeva, but more often I'm called zeska over the internet. I do knit and I do sew. I also bead, paint, draw, program with matlab, dye, bake and the list goes on. I guess I grew up to handscrafts as sort of a lifestyle. I'm also from Finland, a place known mostly for being cold. I'm also not a native speaker of English so just bear with me and all my mistakes with the language. I decided to join once I saw that the project for this month was a top. You see: a friend of mine is getting married in late June and I need something to wear. I have two lovely skirts to wear, but nothing for my upper torso. 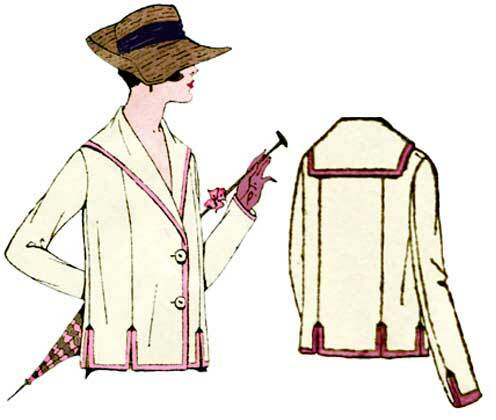 I guess I'd like to do a jacket as my project, but if that isn't "top" as such, I need to finish a top for it also. (I just want to do the jacket part since finding a top to fit it is much much easier). 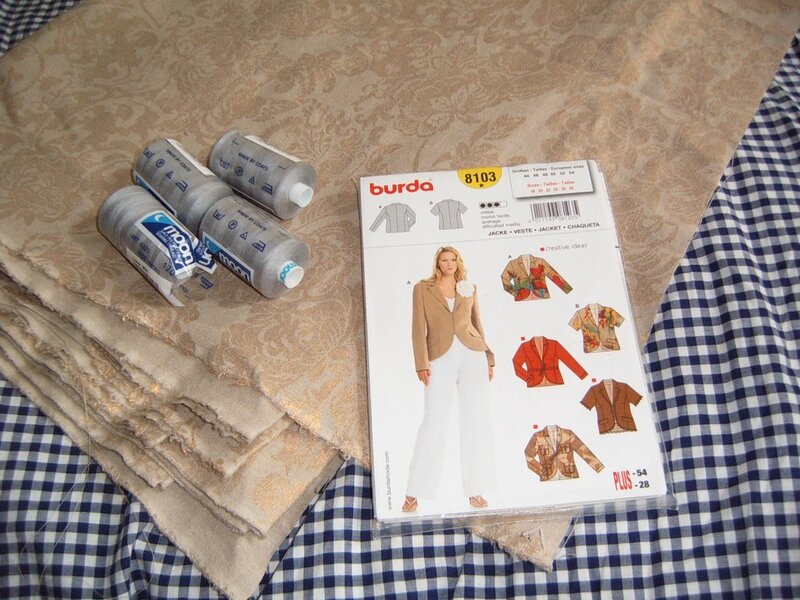 The pattern I'll be using is Burda's 8103, a jacket for women in larger sizes. 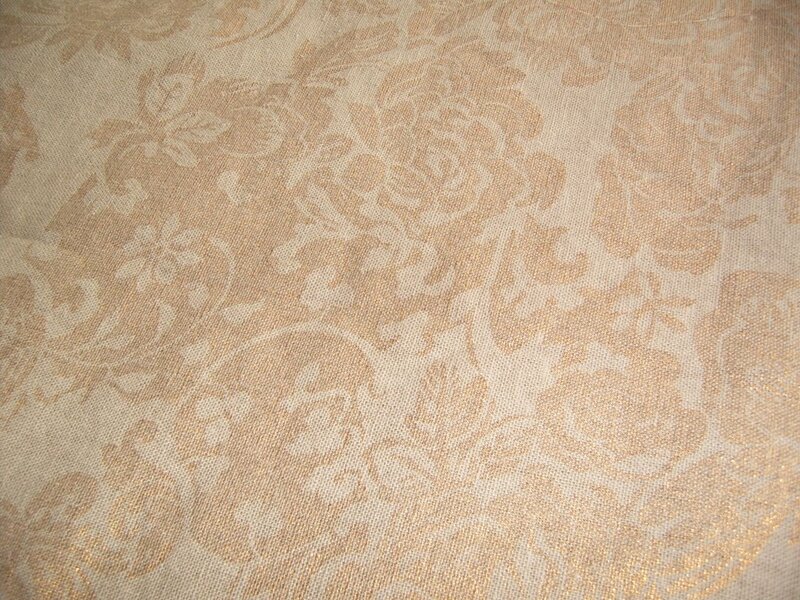 My fabric is 55/45% linen-viscose blend with a lovely golden print on it. The four rolls of grey yarn on top of the fabric are a reminder for me to get in touch with my overlock machine, the local yarnstore (oops, fabric store really... I do knit too much.) didn't have anything that would match better ... And I'll probably be doing a mock version of the jacket too, just to see how it fits. Here is a close up of the print on the fabric. It really glimmers a bit so I guess it should be fine for a bit more festive jacket to pair with a wide skirt and some nice top. I've changed my mind about the fabric I'm using for this project, and also decided on the pattern I'll be using. My last post for reference. 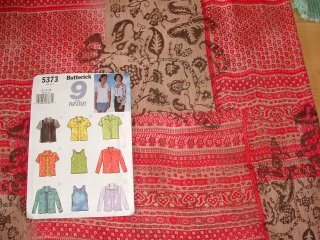 I am hoping to finish a Hawaiian shirt by July 15th, but am punking out on starting right away with something so ambitious, and am instead making this simple long-sleeved T. It's in the right-hand corner of the pattern, and the pattern is on top of the fabric, in the style of Alyssa. The fabric is a burgundy knit, very soft, and there may be enough to make one of the other pieces, too. However, I am thinking that the T will be good with skirts and pants in the fall. I am hoping to find a good print to go with it, but have had no success at my local fabric stores. 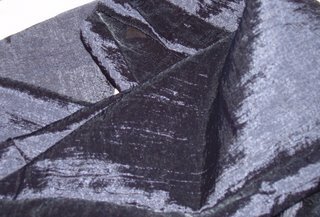 Does anyone out there have a favorite online fabric store? 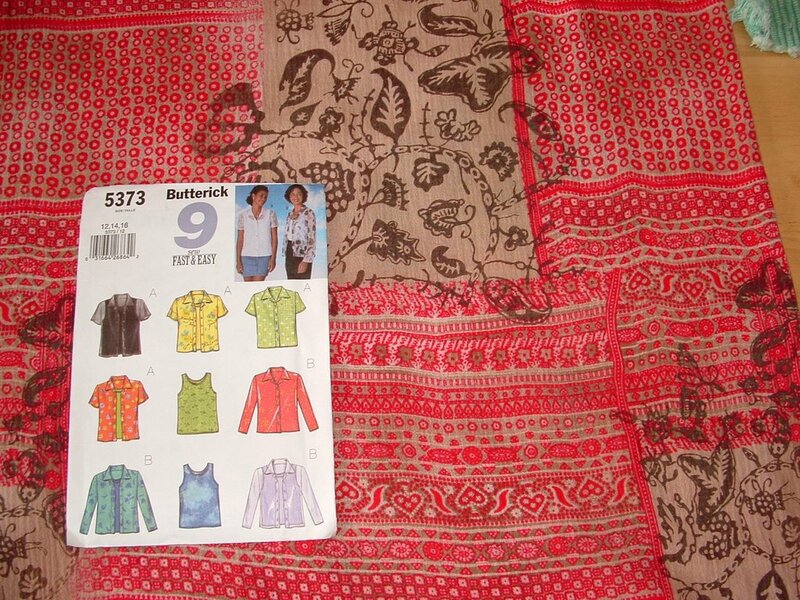 I know a couple of good online quilt shops, but haven't found much in the way of fashion fabrics online. Suggestions will be appreciated -- thanks! Hello, everyone! My name is Joanna, I'm new to this SAL but not to sewing so I'm expecting lots of fun with interesting projects (I'm soooo sad I missed skirt and bag projects, these are my two best things to sew!...). 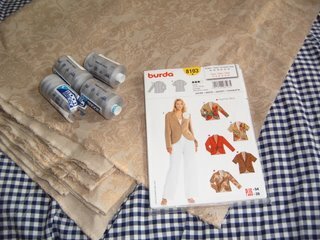 I am going to make a top for myself inspired by the fashion of Gudrun Sjoden's, I'll be modifying the pattern from Burda. More details soon (as well as fabric choices). I've made a decision! 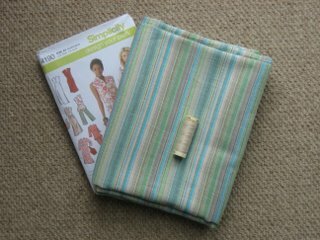 Simplicity 4589! I couldn't find the other pattern I wanted [heavy sigh]...but I've seen this pattern in action over here and it looks fabulous! I'm thinking either view A or C; and I'm going to attempt to use what I have in my fabric stash! GASP! I'm Erica and I've "stalked" this site from the beginning before I joined. I didn't get a chance to participate in last project, but I did a bag on my own. 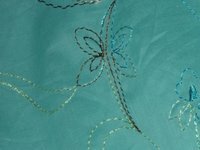 This site has been a great inspiration in getting me re-involved in sewing again. My name is Sheryl and this will be my first project for the SAL. 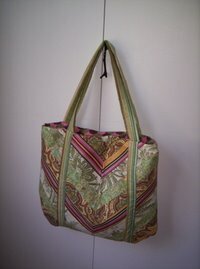 I have been lurking during the bags project and all the projects looked great. Plus everyone was having a great time. I have chosen the Amy Butler Cabo Halter pattern. I used to wear a lot of halters "back in the day" and I hope I can still pull it off. My pattern is on its way and I am going to look for fabric today. I am looking forward to seeing all the wonderful tops. I've been stalking this sew-along for a while, but I've finally decided to join the fun! I've recently finished a sleeveless top made from a pink and purple camo duvet cover and a long-sleeved shirt. The fabric I'm using is an old duvet cover that used to be my mum's when she was younger and then it was mine, so it's on it's thrid life! 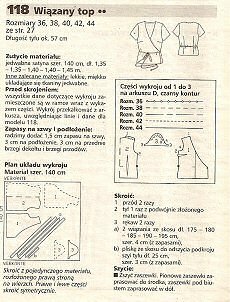 I have a choice in mind; either a relatively simple gypsy top or a more complex princess-seam shirt (both from old issues of UK magazines). I'll ruminate on it for a while and make my mind up nearer the time! I hope no one minds me posting this here, but I've been so impressed with all the gorgeous and creative bags that people have made over the last two months that I couldn't help but create a blog just for bags and the makers of them. It’s called Bagaholics Anonymous and is a place for us all to meet and show off the bags we’ve made. Got a problem, come to us! Making bags is not shameful anymore. Come out of the closet and be proud!! Send Linda or me lolly_de(at) gmx(dot)de an email telling us about your problem along with your blog URL and we’ll add you to the list of sick people contributors. Then you can just post away. Show off your creations. Hear from others that can’t get enough. Tell your neighbours, tell your friends! Here are two buttons to show others that you are getting help, or in our case help in the form of acceptance. Satisfy that inner need for more bags. Join us in our quest to unleash the bagaholic in all of us! Hello all! Newbie here! Well, just to SIK but not to sewing. I've been sewing for about 12 years now but only making small things like bags and pillows; I'm just now starting to get into making clothing. Knitting is my new addiction, but we won't get into that will we! This is about sewing!! Yesterday I bought my pattern and oddly enough it's the same kimono type as in the previous post...I'm having second thoughts though. I went searching around online and found this...I have to make the teal version! I guess I should make a decision soon! Just nothing with buttons! That scares the ba-geezus out of me! 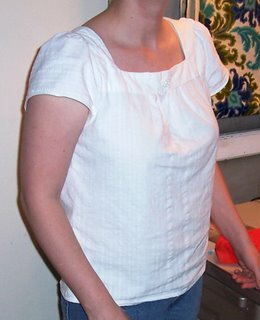 Well, this isn't exactly headline news but if it's tops we're making, I have a couple patterns in my stash that I have been anxious to sew up for the summer.I was already in the process of making the Thia Tee from La Fred patterns in the photo below. 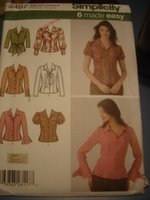 This is a great pattern if you don't mind sewing darts which really give it its shape. Also, I only have a regular sewing machine and if you are going to be using a lot of knit fabrics and most importantly, can afford one, a serger is the best bet. I limp along with a slight zigzag for knits. 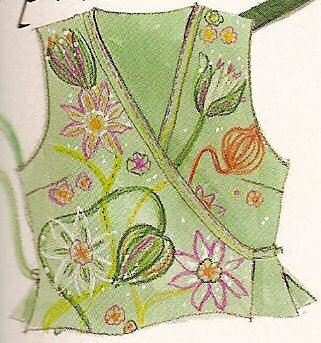 Also, there is some top stitching involved here as there is with most knits, so a twin needle result would be fabulous. 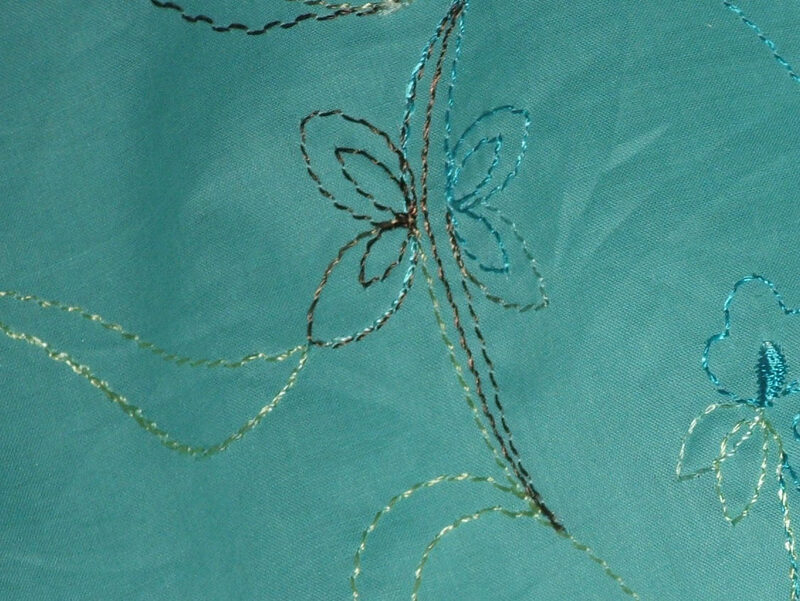 I have to top stitch twice to get a similar, if a bit zoinky, effect. More details here. love this pattern and was looking for a good reason to make it. the upper left kimono style. I've got all the details and a fabric sample here. Here is the pattern and fabric slapped on the scanner for thine viewing pleasure. I'll be making version C, on the left. 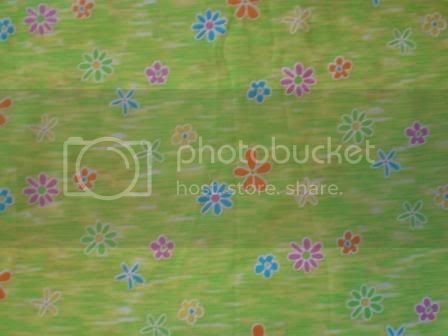 The fabric is Denyse Schmidt. 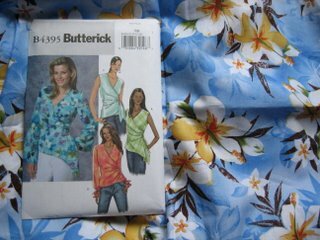 I just finished a blouse, but I need more, more, more summer blouses in twee fabric. Tra-la-la! 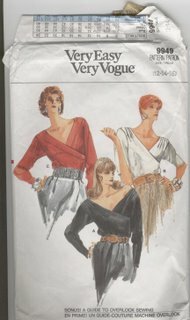 It occurs to me that I haven't done much sewing for myself since the '80s. I have a gorgeous collection of designer Vogues, but, Wow, look at those shoulders!! I think I even have a pattern for a Talking Heads suit! 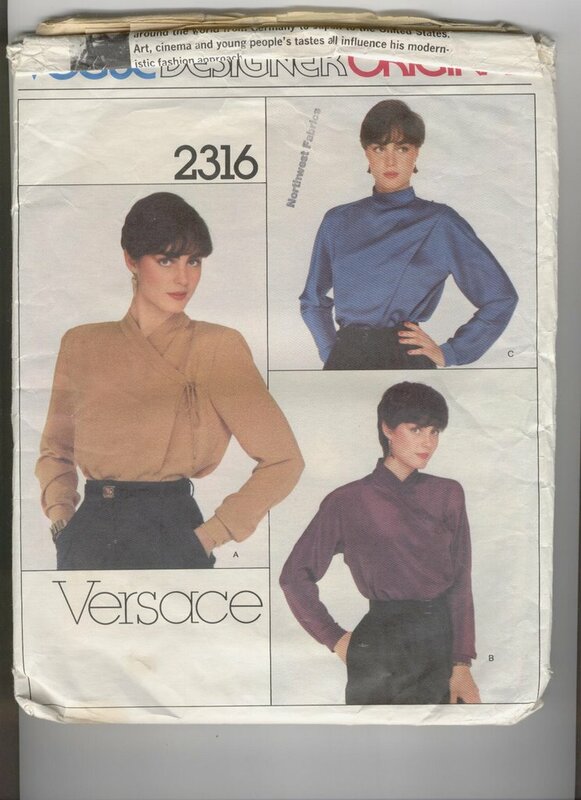 Versace in the '80s was molto bene. The purple one has kimono sleeves with no shoulder pads and a nice little wrap. Here's a little surplice t-shirt that I made once and loved. (The red one...) I think I would prefer 3/4 sleeves now, though. 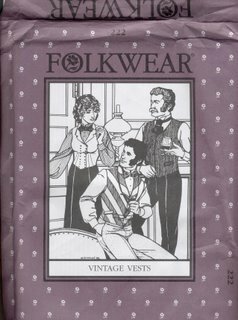 Or there is this later model Folkwear vest. Waddya think? Can I pull this off? New project - sorry for the delay! What About THIS for a New Challenge? Hey! I'm finished on time! How cool is that?